If you want to work with an agency specialized in online marketing with proven reputation in delivering visible results, the next lines are for you. 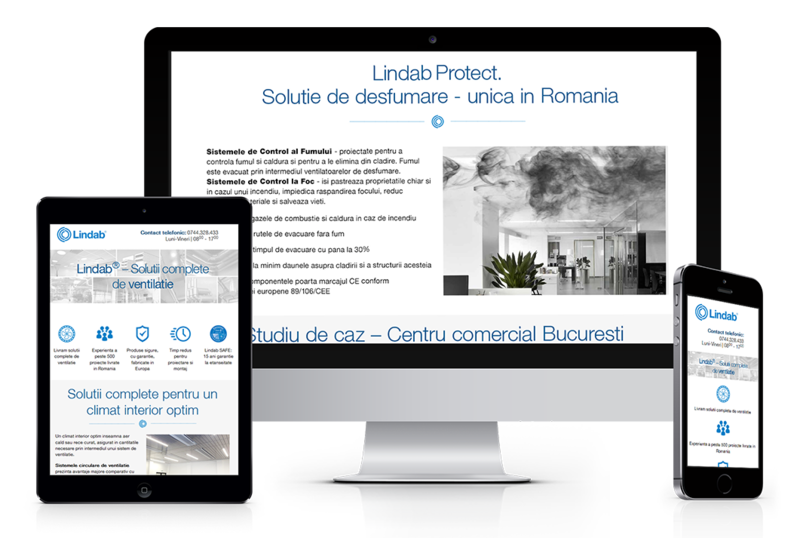 We have over 12 years experience, during which time we worked both on the domestic and international markets and have gained the Google’s Partner Agency, status, rated in the top of agencies in Romania. In addition, we are the first local agency certified Convert.com, instrument used in conversion rate optimization. We provide digital business solutions to grow your business online, to communicate better with new audiences, streamline your processes, and help you engage with your customers to get to the next level. We are your digital partner, focusing on planning and building the best user experiences. All our projects, large or small, begin with a deep, insightful understanding. We can only really help a client when we truly understand not just the brief but also – who our clients are and what makes them tick. Investing time in this deeper level of understanding is what provides us with the insight and ability to create comprehensive functional specifications and make recommendations that will deliver measurable and meaningful results for our clients. When we start a new project, we ensure that we find out as much as we can about you and your current software solution. We do this using a number of different processes and techniques, some we can perform in house, whilst others are based on client facing workshops, discovery meetings, interviews and more. During the research we will be assessing and evaluating eCommerce procedures and how online clients and online leads are generated for the company and how they are processed. Whilst it’s important to plan a site architecture and build wireframes to understand what content and functionality is required – it’s not until you put a specific user’s hat on and try and walk around a website that you truly start to understand where content or functionality is easy to find, use or interact with. Especially when you consider that one user’s motivation or requirement could be quite different from another user. 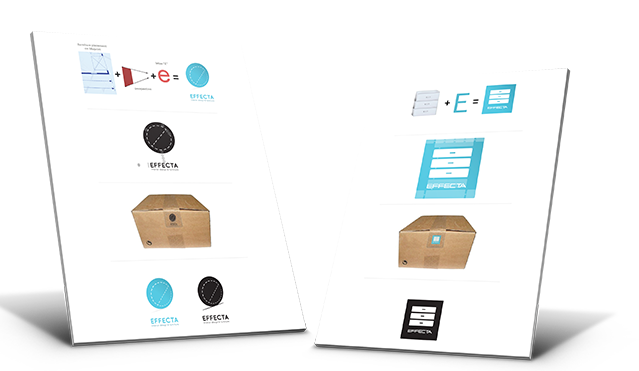 We create Use Cases and document the User Journey process to identify critical tasks that particular users will need to make. We will drive initial workshops with key stakeholders, compile the specification in line with the strategy, and overview the development through to final implementation, resulting in a powerful and customised system for your organisation. We can use various project management methodologies, depending on the type of project and your requirments like Waterfall and Agile- Scrum. Starting from your business objectives, we create websites that encourage users to action and ofers them an optimal browsing experience. 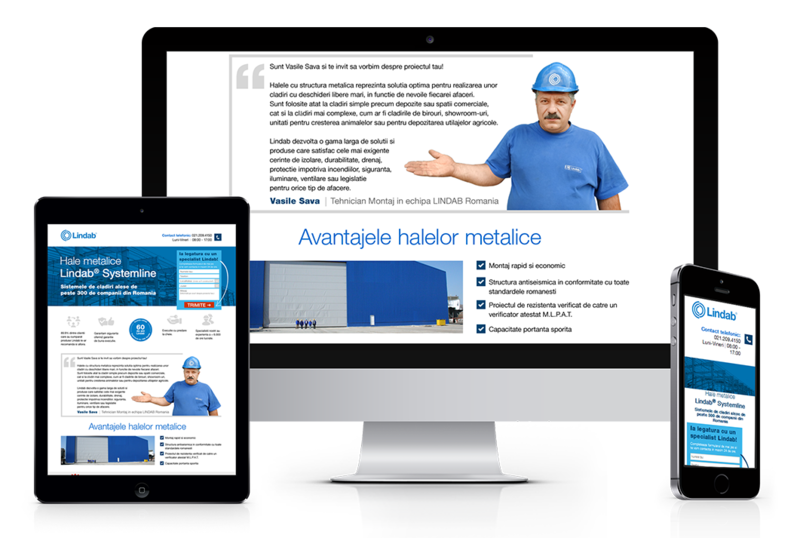 We are always up to date with all the news and studies in the area of usability, conversion rate optimization and web design in order to develop websites and landing pages that delivers visible results. Enter the world of fashion and walk on the catwalk! Meet the designers, models and applaud the winners. For Fashion TV we have developed a custom CMS for content management, news, job postings and much more. Used technologies: PHP, MySQL, HTML, CSS. 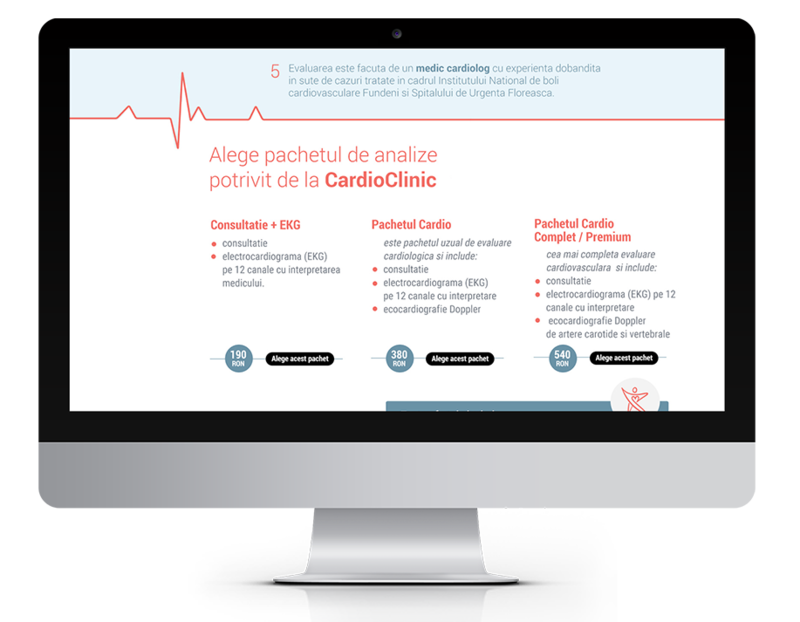 We have developed a customized system management of content based on detailed specifications received from the client, to Universal Music Romania. The CMS was built to interact with various types of foreign service ,giving users a broad range of possibilities for interaction. 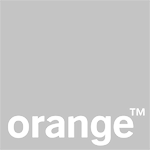 Used technologies: AJAX, PhP, MySQL, HTML, CSS, Cutom APIs. In online marketing campaigns, the keyword for us is „performance”, the most important indicators being the online sales and generated leads. We have a portfolio of over 610 managed campaigns and over 260 audits, our team expertise covering various PPC marketing tools. Annually, we generate more than 98,000 conversions for our clients, both in local campaigns, and international, in countries like Australia, USA, Hungary, the Czech Republic, Bulgaria, Croatia or Poland. 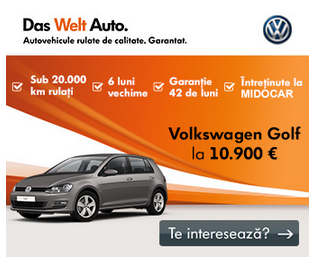 Using the strategy of multi-channel online marketing campaign, for “50 Golfuri” campaing, which had as its objective to liquidate a stock of 50 cars Volkswagen, have generated a total of approximately 1,000 of lead in only a month and a half. 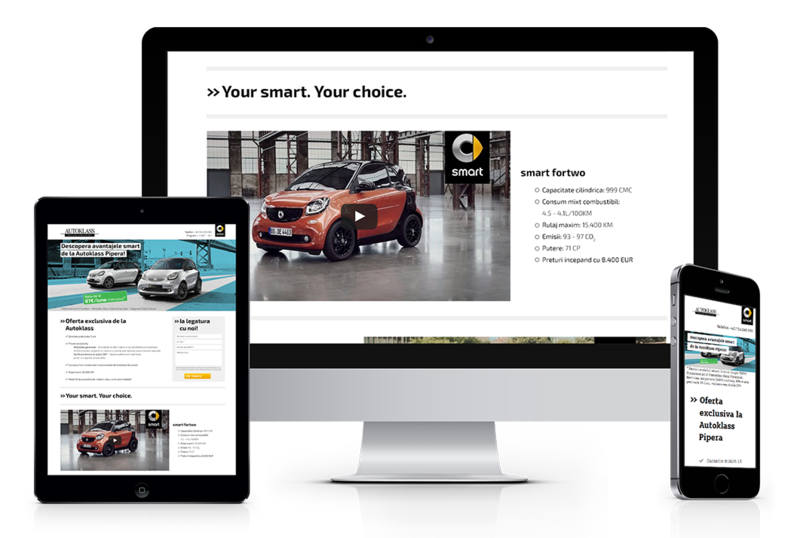 Over 70% of lead have originated from Facebook Ads Ads & Facebook Retargeting campaigns, and the lead’s cost was 2-3x smaller than the regular cost in the automotive industry. 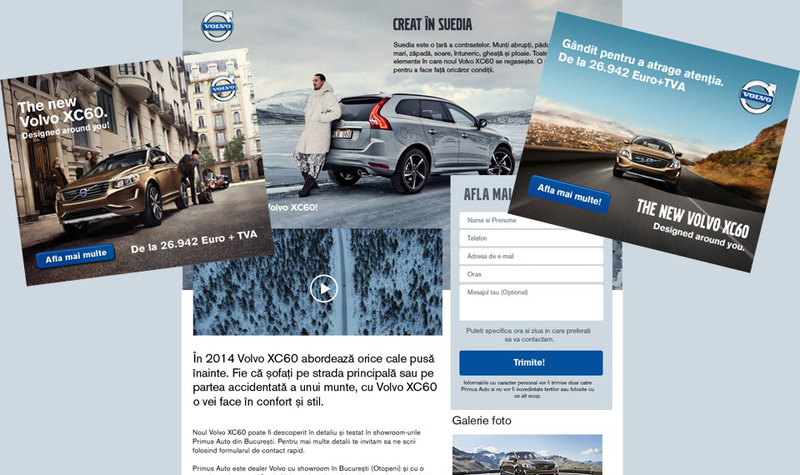 For Volvo dealer, Primus Auto, in Bucharest, we created a landing page with the objective to generate lead for XC60, as well as sets of banners for Google AdWords campaigns, in various stages of the campaign. In order to attract traffic to the landing page with acquisition interest, we used PPC marketing tools such as Google AdWords, Google AdWords Display (+ YouTube banner ads) and Google Remarketing. BARRIER has registered a 30 percent increase in sales in the post-campain period, versus the same period of the previous year. Lead generation from online actively contributed to the sales growth. Google Search brought 33.8% and Google Display 25.9% from the total recorded lead sites registered within total 15-month campaign. Our clients choose us because we save time and because, thanks to the performance level, the management’s costs are almost 0. 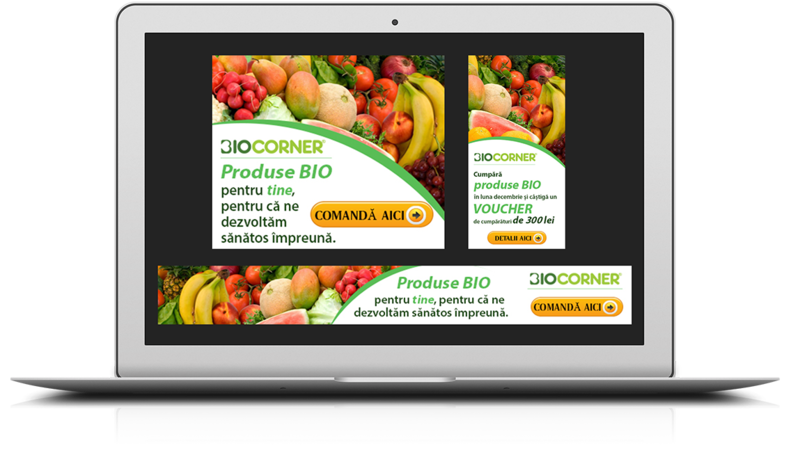 In Romania, we are the first online marketing agency certified for projects that includes conversion rate optimization and A/B testing through Convert.com instrument. This instrument helps you find the winning version for text, video and website design. This version can double or triple your clients number gaind online, without growing your media cost. Case Study: A minor change has increased the conversion rate by 133%. An e-commerce customer has asked us to help implement a website solution to increase the value of the shopping cart. 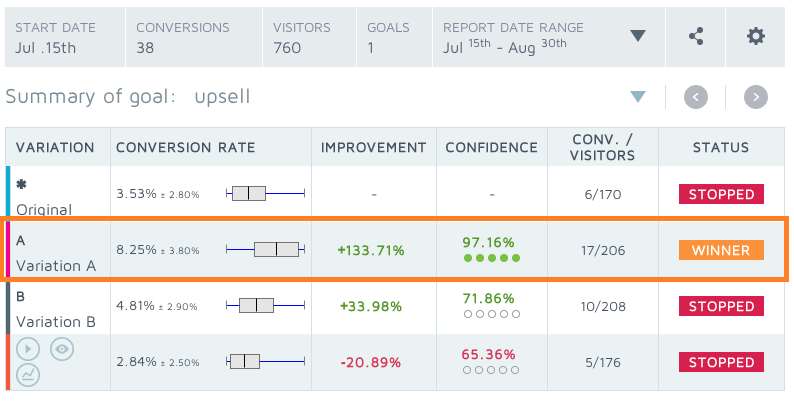 Initial conversion rate (to upsell) was 3.53 percent and through A/B testing we managed to grow up to 8.25%. A strong identity is the starting point of any successful brand. Through unique images and expressive language, we lay the foundations of an brand identity reflecting positioning, vision, and goals of your business philosophy. 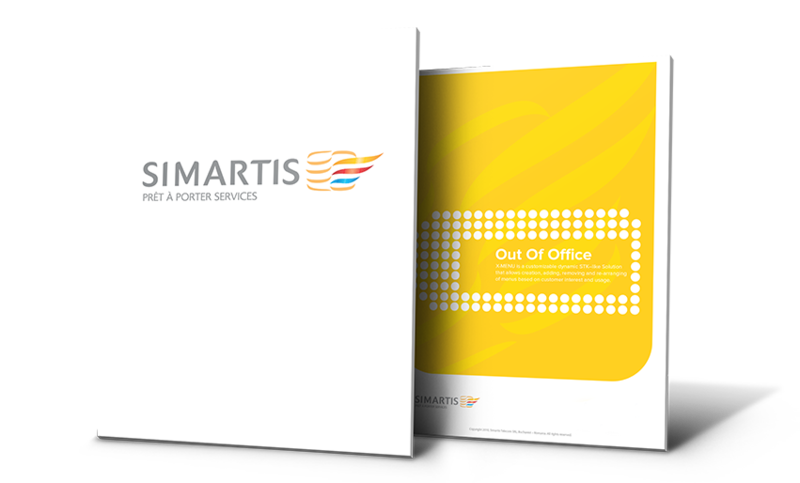 We lay the foundations of a brand manual containing standards of work for any graphic elements, whether related to print, whether related to consistently communicate the brand’s image regardless of channel. 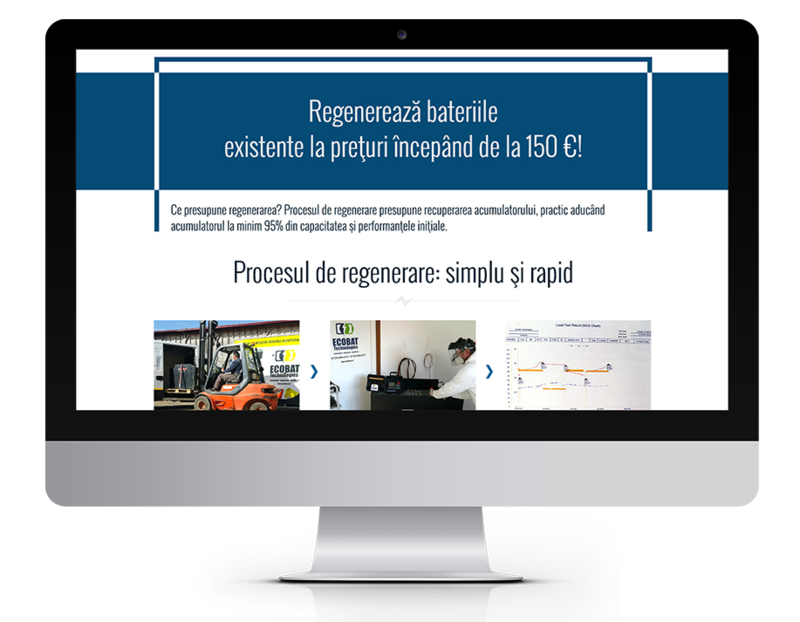 This information note is sent via our website and, by request, by post or e-mail, using the request for correspondence address: e-mail: office@todays.ro, in writing, at: Sos Colentina 24, bl 10, ap 56, sector 2, Bucharest. Our company expresses the joy of your visit to our site and the interest in our products. Thank you for your trust! In this regard, we seriously treat your personal data protection and want you to feel safe when you visit our website. The security of your personal data, whatever it is (name, address, phone number or mail address), is an important concern for us. That is why we take into account the security of your personal data in all of our business processes. On-line activities are conducted in accordance with data protection and security laws. Next, you'll find out what information we collect and how we treat them. Be careful! Our site may contain links to sites on the Internet that may or may not be covered by data protection statements and this is the responsibility of the owners of those sites. Please check for access to an external site Policy and Statements of its Owners regarding the protection of personal data, which is the responsibility of the owner of the site. This Processing Policy applies to the personal data of visitors and users of our site that can be accessed on our site. For any situation that does not correspond to this policy of processing and protecting your personal data, if you do not fit into any of the categories listed above, please contact office@todays.ro and we will provide you with an information set according to the situation where you are. The collection and processing of personal data is made in accordance with the legal provisions, respectively Regulation (EU) 2016/679 of the European Parliament and of the Council of 27 April 2016 on the protection of individuals with regard to the processing of personal data and on the free movement of personal data circulation of these data, as well as the Romanian legislation in force. Romanian Supervisory Authority: National Authority for the Supervision of Personal Data Processing, to be contacted at 28- 30 Gd. Gheorghe Magheru Bd., Sector 1, postal code 010336, Bucharest or www.dataprotection.ro. We collect and process your personal data when interacting with us (for example, the information you provide by completing the forms on our sites or by contacting us by phone, e-mail or in any other way). There is information you provide when you sign up to use the site when you subscribe to our services when you participate in discussion forums or other social communication activities on our site by completing a form on site or otherwise, enroll in contests, promotions or studies organized by us and when you shop on our site or when you report a problem related to our site. The information you provide may include the name, address, e-mail address and telephone number, personal description and photo, age, date of birth and gender, as well as other information as appropriate. We will not collect or process sensitive personal data related to you (for example, information about racial or ethnic origin, political opinions, religious confession or philosophical beliefs, health, sexual life, or sexual orientation), unless we are You are required to do so by law and / or if you have given us your explicit consent separately. If you voluntarily provide us with personal data (including sensitive personal data) through your interaction with our site or by contacting us by phone, e-mail or in any other way from we will delete such personal data from our systems if we do not consider that processing is necessary for a legitimate purpose unless you made these public data (for example, in a forum messages that are publicly visible), in which case we will delete this data from our site at your written request or only if the law imposes it or if we do not want to keep it. Warning! We do not collect personal data through our website without letting you know. You are the only one who decides whether or not you want to make this information known to us on site registration, placing an order or poll. You may withdraw your User Agreement for any personal reason for any reason by a notice sent to office@todays.ro or you may send a letter to the person responsible for the personal data protection of Links Group SRL at: Bucharest, sector 2, str. Sos. Colentina, no. 24, bl. 10, ap. 56, Romania. Note: The withdrawal of your consent will not affect the legality of any processing that occurred prior to its withdrawal. Technical data: This may include the Internet Protocol (IP) Address used to connect your device to the Internet, the login information, the browser type and version and its extensions, device type and brand of mobile device this data can be collected and processed on our behalf through third-party cookies, and you can find more information about it on our site. Data about your visit: may include complete Uniform Resource Locators (URL), sequence of clicks to, through and from our site (including date and time) (including posted published materials, uploaded material categories, page response times, download errors, duration of visits to particular pages, time spent in an application, and the number of views in such applications apps, average number of materials viewed on our site, information about your interaction with pages (such as scrolling, mouse clicks and crossings), the methods used to navigate the page, the data about your behavior and any phone number you use to call us or any email address used to contact us. We can process your personal data if we need to execute a contract that we have concluded with you; if we have to respect a legal obligation; when it is necessary for our legitimate interests and / or for your interests (for example, for detecting and preventing fraud or for ensuring network security), unless your fundamental rights prevail over these interests. We process your personal information for a variety of technical, administrative, and operational reasons, such as ensuring that content is presented in the most efficient way for you and your computer; to improve our site, including its functionality; for its administration; for internal operations, including for purposes of data analysis, testing, research, statistics; for advertising and marketing, so we can offer customized content that might be of greater interest to you. If we request personal data to comply with legal or contractual obligations, the provision of such personal data by you is mandatory. This means that if such personal data is not provided, we will not be able to manage contractual relationships or comply with our obligations to you. In all other cases, the provision of personal data is optional and you are under no obligation to provide it. Within the company, a limited number of staff members, such as those in the administration, sales or IT departments, have access to your personal data. These staff members are subject to confidentiality obligations with respect to personal data. Appropriate technical and organizational measures are taken to protect personal data. Company staff members have the right to manage personal data only in connection with their service responsibilities and the processing of any personal carriage data is highlighted in a record keeping record of such processing. Personal data may be communicated to governmental authorities and / or law enforcement agencies if required by applicable law or if necessary for the exercise of our rights, including conditions of use, or for the protection of our legitimate interests (including legitimate interests of third parties) only in accordance with the applicable laws. service providers that provide administrative, professional, and technical support to the company for IT support, security and commercial resources; namely the accounting firm, the courier service or other companies that help us from a technical or logistic point of view. search engine analytics and search engines that help us improve and optimize our site. Your personal data we collect is stored in the European Union ("EU") and in the European Economic Area ("EEA"). However, information collected by third parties through cookies (e.g., through Google) will generally serve traffic from a data center outside of the EU / EEA. This means that such information, including ad traffic, can be managed by servers located in the EEA and can be transferred outside the EEA. For more information, see the Cookies Policy. In addition, your personal data may be transferred and stored in a non-EU and EEA location by these third parties. When your personal data is transferred from your own country to another country, the laws and rules that protect your personal data in the country to which your information is transferred may differ (or may offer less protection) than those in the country where you are. We intend, as a general rule, not to transfer your personal data outside the EEA unless there are adequate safeguards. To learn more about transfers and the appropriate safeguards that we have set up before these transfers, you can contact us using the communication data above. provide a copy of your personal information and / or correct it. using your right to ask us to delete your personal information. Stop processing of your personal data (e.g., use of direct marketing processing or certain automated processing decisions (including profile creation). withdraw your consent to the processing of personal data. Restrict the processing of your personal data under certain circumstances you desire or request the transfer of such data under the conditions you desire. We will not charge fees to meet your request. If you wish to exercise these rights, please contact us through the contact details mentioned above. We retain your personal data only for as long as it is necessary, in accordance with the Data Processing Policy, for a period not exceeding the period required to meet the purposes listed in this Information Note and / or required by applicable law, in accordance with the minimum legal retention periods applicable and / or as long as we need to exercise our legitimate rights (and the legitimate rights of other third parties). If we process your personal data under your consent, such personal data will be processed only for the period of your consent, unless you withdraw or limit it before the expiration of that period. In such cases, we will cease processing of that personal data for the relevant purposes, subject to any legal obligation to process such personal data and / or our need to process such personal data for the purposes of our legitimate rights (including the legitimate rights of other third parties). We keep your data on our servers and servers hosted by third parties (including cloud-based services). We use appropriate technical and organizational measures to protect your personal data and prevent unauthorized access. All payment transactions will be encrypted but you are responsible for maintaining the confidentiality of all means of authentication (eg passwords) used by you to access parts of our site. Data transmission over the Internet is not entirely secure. While we will do our best to protect your data, we can not guarantee the security of your data submitted to you on our site; any transmission is at your own risk. Only after we receive your data will we use strict procedures and security features to try to prevent unauthorized access. We do not knowingly collect personal identification data on our site from people under the age of 18. If a parent or guardian is aware that minors under their direct supervision or not have provided us with their personal data, they must inform us immediately. If we find that a person below the age of 18 has provided personal data, we will destroy this information from our servers immediately unless the parent or guardian gives explicit consent to the processing by us of the minor's personal data. Our site can provide links to sites that we do not control. Once you click on a third-party link, you will be directed to that site. For each visit, you need to review their privacy policies. We are not responsible for the policies and practices of other companies. We do not control and assume no responsibility for the content, privacy policies and notices or practices of third-party websites or services. If you have any questions or concerns regarding the processing of your personal data or if you wish to exercise your right, you can contact your personal data protection officer at office@todays.ro or you may send a letter to the person responsible for the personal data protection of Links Group SRL at: Mun Bucuresti, sector 2, str. Sos. Colentina, no. 24, bl. 10, ap. 56, Romania. Please do not disclose sensitive personal data (eg information about racial or ethnic origin, political opinions, religious or other beliefs, health or membership of a trade union), personal numeric code , social health insurance card numbers or criminal record information when we have contact through our site. We'll update this policy when new data appears or legislation will ask for it. 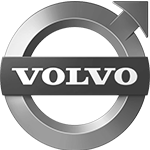 We will notify you of any change either by posting the new version on our site or, if you have provided us with your contact details and agreed to contact you, we will notify you using the contact details provided. Please consult this information notice periodically for any changes you may have. Attention! Our site may contain links to sites on the internet that may or may not be covered by data protection statements and this is the responsibility of the owners of those sites. Please check the access to an external site Policy and Statements of its owners regarding the protection of personal data, which is the responsibility of the owner of the site. What are these and for what purpose are they used? Our site uses cookie technology to provide you with better services and customize them according to your preferences. The data stored by the cookies used on our sites never show personal details on which an individual identity can be established. We hereby notify you that you can withdraw your consent to cookies at any time. To do this, you can block or remove cookies either through your internet browser or by using programs that you can find online / free or buy / etc or by following the specific instructions for categories of the current cookie information note, respectively, by accessing the link above. Attention! Sometimes you may experience problems with using certain parts of your website if you disable cookies. Depending on the program you use to browse the Internet, different means can be used to disable cookies. For more information, please visit the Negliger's Internet settings or even the browser of your site. To learn more about cookies, please visit www.allaboutcookies.org , the site contains additional information about advertising and privacy online. They allow you to surf the pisces and use its basic functions. They are installed only as a response to your actions, actions that are equivalent to a service request. These cookies are indispensable to the use of the site. They are used to recognize you when you come back to our site and allow us to offer you enhanced and personalized features such as your perennials. They collect anonymous information and can not track your browsing on other sites. The expiration date of these cookies is up to 2 years. There are files that analyze the behavior and allow us to recognize and count users, to collect information about how the site is used (for example, the pages you use most often, and if you receive error messages from specific pages). Marketing Cookies and Target Audience Identification records your visit to our site, the pages you've visited most often or the most, and the links you've visited from our site. We use this information to provide information and advertisements relevant to you and what interests you. They are also used to measure how many times you see an ad and help us measure the effectiveness of your advertising campaigns. We may share this information with third parties (such as advertisers) for this purpose. The expiration date of these cookies is up to 2 years. As for third-party cookies (see below), the expiration period may vary and may in some cases exceed 2 years. These allow you to share your work on social networks such as Facebook, Google, Instagram, etc. on our site. These cookies are not controlled by us. Information generated by cookies about your use of the site (including your IP address) will be transmitted and stored by Google on servers that can be located in the EU, EEA and / or the United States . Google will use this information to evaluate your use of the site by producing reports on the activity of the site for our site operators and / or providing other services related to your activity on the site or the use of the Internet. Google may also transfer this information to third parties, as required by law, or when such third parties process the information on Google's behalf. Google does not associate your IP address with other data owned by Google. You can opt out of Google Analytics without affecting the way you visit our site. Detailed information about Google Analytics and the protection of your personal data (including how you can control information sent to Google) can be found at: https://policies.google.com/privacy/partners. You may prevent the logging of cookie data and your use of the website (including your IP address) by Google and the processing of such data by Google by downloading and installing the browser plugin available at Address https://tools.google.com/dlpage/gaoptout. More detailed information on conditions of use and data protection found here and here. We draw your attention to the fact that our Google Analytics website has been expanded with the code "gat._anonymizeIp ();" to ensure anonymized IP address registration (so-called IP masking). Google Analytics: In order for you to receive customized ads and marketing content according to your preferences, our site uses Google's DoubleClick for Publishers (DFP) and Google Ad Exchange technologies. You can find more information at https://policies.google.com. Information generated by cookies about your use of the site (including your IP address) will be transmitted and stored by Google on servers that may be located in the EU, EEA and / or the United States. For more information about Google Analytics, see the previous chapter. Third parties providing apps through the site can place their own cookies to monitor the performance of their apps or to customize those apps for you. For example, when distributing an item using a social buttons sharing button (eg Facebook), the social networking platform associated with that button will record it. There may also be integrated content on the site (eg video content of other parties - eg YouTube), and in this case these third parties may also place their own cookies. Such cookies can not be accessed by us. Our policy on using cookies is available on our site.